Perfect for weddings, costume, dress-up, etc. This veil is perfect in length and has a slight ribbon around the edging. It is easy to wear in hair with the attached hair comb. 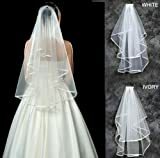 It is a double layer veil with one layer being shorter than the other. It could be used to pull up over your face if you wanted that. It is solid Ivory and very sheer, so the back of the dress is very embellished can be seen perfectly through it. The veil goes down just above the hip area on you, and looks amazing with the dress. The veil is made of 100% tulle and is a soft material. It is perfect accompaniment for any wedding dress.